Although I have always been interested in the mind and thinking, I have been suspicious of psychology and the cognitive sciences. Recently, I’ve been impressed by several TED Talks that address new ideas in the sciences of the mind. These subjects are starting to provide valuable insights into how the world really works. It is still wise to be skeptical, but we might have made enough mistakes in psychology that we now have some groundwork upon which to start figuring out what is really going on in our heads. So I was delighted with the chance to go into more depth in the science of decision making by reading Jonah Lehrer’s 2009 book How We Decide and participating in a discussion with the Ben Franklin Thinking Society. First, some overall impressions of the book. I thought Lehrer gave a good account of how the emotional brain works and some strengths and weaknesses in our decision making. I really value how he presents so many examples of experiences and experiments to illustrate the subject. His conclusion, though adequate, did not bring it altogether for me (cognitive dissonanace is a good thing and it helped me write this post!). Jeannie was turned off by Lehrer’s bone-chilling accounts of airplane crashes and psychopaths. However, we both learned a lot about the neuroscience of decision making. For me it was a good read, if not a great book. One major omission from the book was the lack of a diagram showing the relationships among the brain regions discussed. 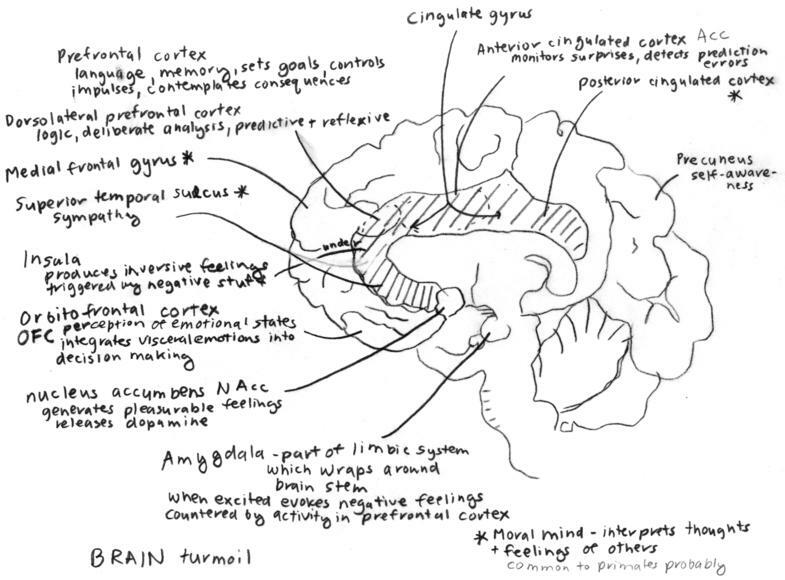 Jeannie drew a rough sketch entitled Brain Turmoil below to give some sense of how the pieces fit. Apparently, the brain uses dopamine-mediated “prediction” neurons to recognize patterns (a dopamine “high” if the pattern fits and a “low” if the pattern is “off”). This effect delivers our “feelings” to a decision making center in the orbitofrontal cortex (OFC). In Lehrer’s synthesis the brain considers these often conflicting signals from its various parts until it forms a decision. Jeannie’s designation Brain Turmoil is apt: chapter 7 is entitled “The Brain Is an Argument”. As I re-read Lehrer’s text trying to pinpoint what emotions are, I found his description too vague. Still I synthesized this working hypothesis: emotions are the self-communicated feelings, intuitions, or instincts formed by dopamine-mediated pattern detection centers in the brain. This gives a nice concrete notion of the nature of emotions that seems to fit well enough with the text and my experience. Does anyone know a better characterization of emotions? The message from the (sometimes excessively repetitive) middle part of the book is that both our “rational” and “emotional” brains can make serious mistakes. Lehrer recounts the emotional brain’s proclivity to find a pattern in any situation leading to grave errors whenever randomness is in play. For example, he explains the gamblers fallacy where one is rapturously deceived by occasional but completely random winnings leading to thoughts that “my turn has come” and the likelihood of bigger losses. He debunks the notion of streaks in sports citing the research of Gilovich, Vallone & Tversky that shows they are just random events that our brain misinterprets. There are more stories of this nature in the book. I had already encountered several from reading Fooled by Randomness by Nassim Nicholas Taleb which goes into great depth on this deficiency in the brain. Taleb details our weaknesses, but Lehrer also highlights some of our strengths and addresses how to make better decisions.